This painting is just about finished and I say that because I usually keep 'touching up' paintings until they actually get shipped out or hung in a gallery. 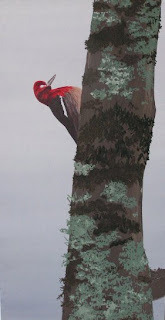 The bird is a red-breasted sapsucker that I saw here locally in Western Oregon amongst some Oregon Ash trees. 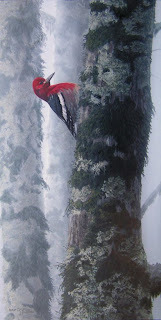 The misty, foggy background is used to create both depth and height in the painting. I also really enjoyed putting the intricacies of the mosses and lichens into the foreground tree to keep the viewer's attention toward the front of the painting. I spent the better part of yesterday morning signing and numbering the 2008 Oregon Ducks Unlmited Sponsor Prints. I am excited about Ducks Unlimited and all they do to set aside and restore wetland habitat throughout North America. I hope these prints do well in the state. The results of the Federal Duck Stamp Competition have been released. When I entered this year's contest I knew that I might either win it or receive no votes at all. It seemed to be an all or nothing type of entry because I took a risk and painted an image in sepia tones to create an old-fashioned look for the 75th anniversary stamp. The idea seemed like a good one, but unfortunately the judges didn't think so. With that said, not all news is good news - I received absolutely no votes (LOL) finishing dead last in the contest. Normally, I finish pretty high - receiving votes and then points - but not this year. Although I still like the painting and what it represents, I am already looking forward to next year's competition. A result like that is motivation! I'm working madly to get some paintings done for the upcoming Peppertree Art Show. The paintings that were sent to Wild Wings earlier this month have sold which is a good thing, but it leaves me a bit empty handed at the moment. I recently have started work on four paintings, three of which are pictured here. To complicate things and add to the hustle of the past couple of days, I am setting up at the annual seasonal gallery here in town called Cameron's Gifts and Gallery. My art along with artwork from many talented Northwest Artists will show (and be for sale) through January 15th at the Heritage Mall in Albany, OR. I have in my possession an unfilled Western Oregon Buck Deer Tag. Deer tags in Western Oregon are very different than deer tags in most states - they are for one blacktail buck not having less than a forked antler. What is so different about that? The blacktail's habits (or lack thereof) and habitat make them very difficult to hunt. They spend their time in thick cover and are extremely elusive. On the other hand, whitetail deer are very habitual in their use of trails and mule deer often spend time in more open country. This season only has a week left after an upcoming one week hiatus and that final week is the beginning of the rut which should bring the bucks out a bit more. So far though, after hunting through thick wet cover, I have only seen does (pictured) and spikes. Maybe the last week will offer the opportunity at one of these elusive bucks. Ahhh... Monday. 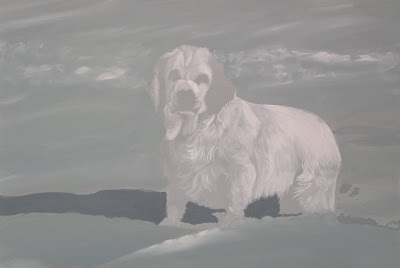 I am working on a commissioned painting today of a clumber spaniel named Truman looking alert and playful in the snow. Here is a photo from the painting in it's earlier stages. There will be more to come on this piece. On another note, I am also beginning to get organized for a couple of upcoming shows that I will post about later this week. 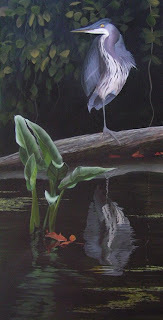 After much procrastination, I have started a new heron painting. Although the sketch was already drawn on the board, the vast amount of white was intimidating and was preventing me from starting. I have heard that procrastination stems from fear. Maybe it was the amount of work that I know this painting will require with all the necessary foliage and reflections. Who knows? But, now that it is started, I am excited about it. I also have a couple of other ideas that are brewing in my head including a painting of a fawn that I may start this weekend. The picture posted here has a bit of a glare on it so the true colors aren't showing through correctly, but the idea is there. 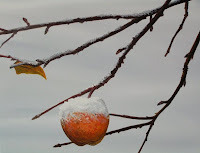 "Reflections" as a finalist in their 24th Annual Art Competition. The winners and finalists will be announced in the upcoming December 2007 issue. 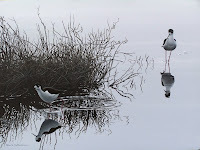 "Reflections" is the same painting that was selected for this years Birds In Art exhibition.